Electromagnetic driving of the uids as the driving mechanism in electromagnetic pumps is of great interest in industry. On the other hand the uid ow in annulus has its own place in investigating the channel ow structure in the sense that we can use it as a model for a very long channel. So we can observe the same ow structure in a con ned area without wasting too much energy and e ort to build a long channel. Although the combination of electromagnetic forces with toroidal geometry sounds ecient and practical, but lots of questions will arise when we do combine them. These questions are mainly about the formation of Hartmann layer and its role on triggering turbulence as well as the e ect of curvature and appearance of secondary ow. During the last decades several numerical and experimental investigations were aimed to uncover this ow structure 1 and determine its instability criteria2 . Their way was to use the potential drop as the detector in a channel of 10mm 10mm cross section. Since these voltage drops give us limited information about the structure of the ow, we have decided to spot the possibility of using UDV in combination with a kind of potential drop measurement technique to detect the structure of the ow. 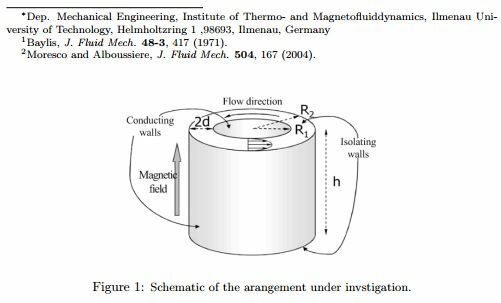 Our channel which has a rectangular cross section of 10mm  67mm and an inner radios of 40mm, lled up with eutectic alloy GaInSn and shown schematically in Fig 1, is imposed to a magnetic eld up to 500mT. Due to the reaction of the axial magnetic eld with an injected radial current, up to 1500A, an azimuthal uid ow will establish. Here we will represents the results of our experiment and compare them with the predictions of the reference literatures. This will help understanding the role of the Hartmann layer on transition to turbulence.